Topics: E-bike Benefits, Custom Projects, Bike Road Laws, Bike Faqs, and Gift Voucher. Its 3 nameservers are c.ns.ods.org, b.ns.ods.org, and a.ns.ods.org. It is hosted by Tpg Internet Pty Ltd (New South Wales, Ryde,) using Apache web server. 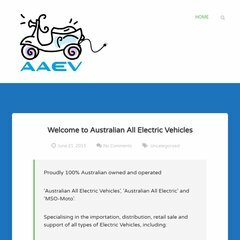 Aaev.com.au's server IP number is 60.240.245.214.